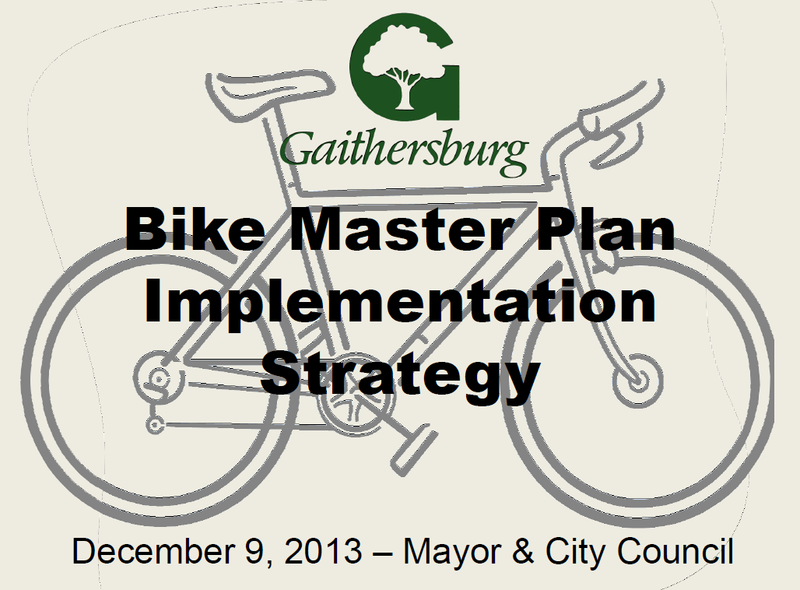 While the City of Gaithersburg has had a bike master plan on file since its development by Toole Group and approval in 2009, little progress had been made due to limited budgets. I asked about it last year at a local event and several City staff members mentioned that it might be something that was brought back now that the City budget picture had improved. Thus, it was great to see an implementation presentation to the Mayor and Council last December. The plan was originally scheduled for a three year time frame and included a reduction in the number of formal bike lanes due to width of the current street configurations. Sharrows made up a large percentage of the network. Still, it was a start. Mayor and Council appeared engaged and supportive. They asked staff for a budget to accelerate implementation within the 2014 budget year. At the last transportation committee meeting, staff indicated they had submitted for complete implementation in the 2014 budget year. There are several items that could be improved about the implementation, as well as the overall network. These items will be covered in subsequent posts. However, it is great start and good to see the City taking action toward building a complete network.